Over the years, almost every new LEGO movie licensed theme has been created to match with a new theatrical release. In the case of big movie franchises, some sets based on previous films were produced before the ones based on the new films. This has happened with “STAR WARS”, “Toy Story”, or “Indiana Jones”. So a good reason to release a fourth Jurassic Park movie was the chance to see LEGO products for the previous films, right? Strangely, the last product license ignores the previous movies and is based only on the last film in the series, “Jurassic World”. It looks a lost opportunity for such a license deal. The key elements in the Jurassic Park films are the dinosaurs, but the movies are also filled with lots of iconic vehicles, locations and characters with a lot of potential for a complete building toy line. The biggest set in a utopian Jurassic Park Theme would be the Visitor Center. This project features a complex building in the facade, as well as some rooms inside to recreate every scene in the movie. 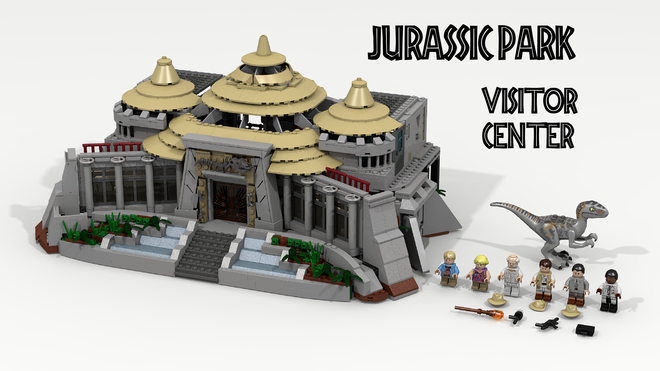 Check all features at: LEGO Jurassic Park, and you can turn this LEGO design into an actual product, by supporting the project. If it gets 10K votes, t will be evaluated by the LEGO group. Is there an e-mail address I can reach you?